Cuisinart Nonstick Round Classic Waffle Iron Who wouldn't want to have waffles with butter and thick maple syrup on the weekends for breakfast? 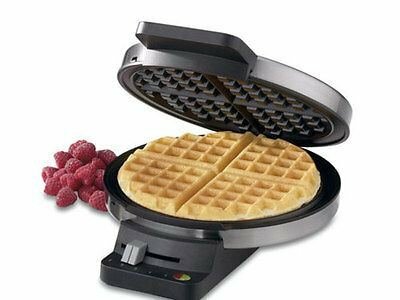 This Classic Round Waffle Maker is a real treat to have in the kitchen, especially when it comes to whipping up a batch of homemade waffles for the family and even friends! It bakes one large traditional-style waffle and features a 5-setting browning control, regulating thermostat, "ready" indicator lights, nonstick baking plates and an instruction/recipe book.